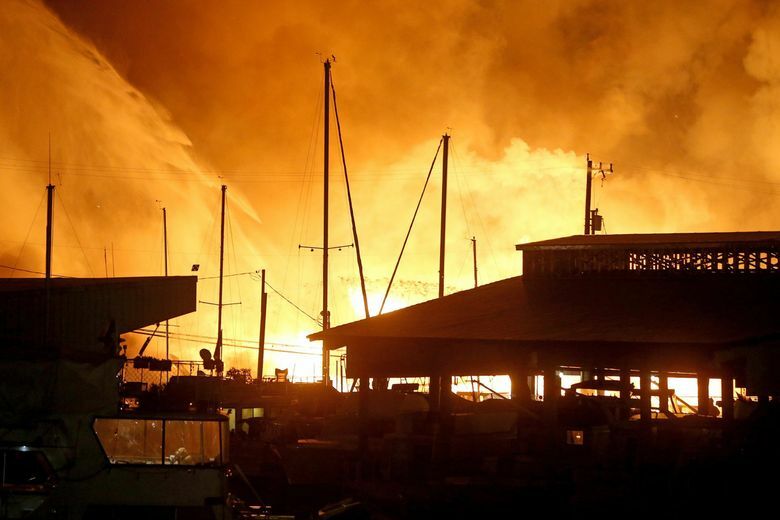 The North Queen Anne lumberyard was the site of a four-alarm blaze that began on the evening of November 10. Flames were shooting 100 feet in the air when firefighters arrived on the scene, the fire department said at the time. The Bureau of Alcohol, Tobacco, Firearms and Explosives (ATF) is offering a $15,000 reward for information that leads to the arrest and conviction of the person responsible for a fierce fire last month at the Gascoigne Lumber Company on Seattle’s Ship Canal. In the days following the fire, the Seattle Fire Department said it was arson and estimated the damage at $4.3 million, but the ATF in a press release Tuesday revised that estimate to about $12 million. No injuries were reported, the ATF said. In addition to the ATF reward, the Arson Alarm Foundation is offering additional reward money of up to $10,000, according to the ATF. Anyone with information about the fire is asked to call the ATF’s hotline at 888-ATF-TIPS (283-8477) or the Arson Alarm Foundation at 1-800-55-ARSON (1-800-552-7766). People can also report information about the fire at arsonalarm.org, by email at arsoninfo@arsonalarm.org, or through ATF’s “ReportIt” app.